​ There probably is no such thing as “safe” ice, but there are some guidelines anglers should consider. 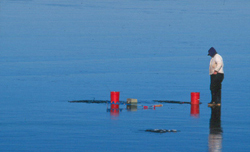 In Colorado, ice conditions can vary from lake to lake. Along the Front Range, it is especially important that anglers check ice conditions before heading out because of the region’s notoriously variable weather conditions. Many of the most popular lakes are within Colorado State Parks​ and anglers should check with the specific park staff about ice thickness before going out. Knowing how to judge ice conditions will help you make more informed decisions while enjoying your outing. 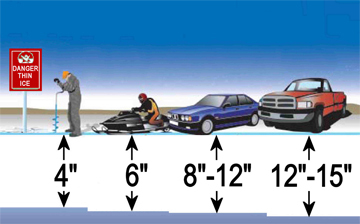 Ice thickness depends on several factors with the first and most obvious factor being location. The type of lake also affects ice thickness; a shallow lake will freeze faster than a deep lake. Look for clear blue ice. New ice is stronger than old ice. Ice thickness is not consistent. Beware of ice around partially submerged objects such as trees, brush, embankments or structures. 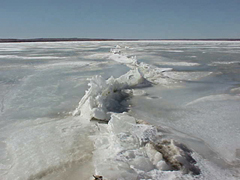 Ice will not form as quickly where water is shallow or where objects may absorb sunlight. 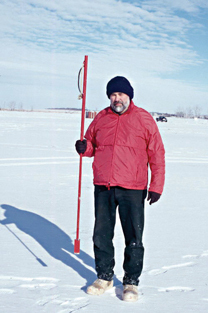 When ice fishing, it is always a good idea to drill test holes or use an ice chisel as you venture onto a lake to help judge the thickness and character of the ice. These “Test” holes should be at no more than 30 foot intervals. The use of crampons, or cleats, for walking on ice is a good idea in Colorado. With the state’s powdery snow and wind, there is often no snow cover on ice. Blowing wind and snow actually polish ice to a glassy, slippery surface. Anglers should carry two picks—or spikes protruding from wooden hand holds—that will float and are securely connected together with a piece nylon cord 24 to 30 inches in length. 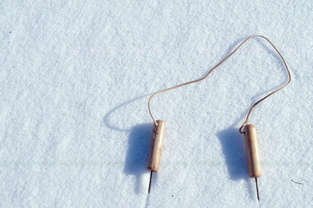 These picks should be carried allowing for quick and easy access in case anglers need to pull their way out if they fall through the ice. 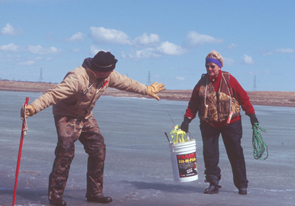 Visit the Ice Fishing Video page for great tips!